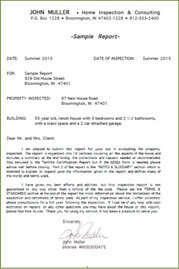 With every home inspection, we offer an extensive, customized narrative report. Each report comes with a separate "Notes and Glossary" section to help our customers better understand the report and to provide some helpful tips and information. Please click below to see one of our sample reports! Expect More from Your Home Inspection! John Muller Home Inspection has more than 20 years of experience providing dependable home inspection services in the Bloomington, Indiana area. Whether you’re purchasing a house, or looking to keep your current home safe and sturdy, it’s critical to have a fair, thorough, and honest home inspection report you can trust. At John Muller Home Inspection, we believe in the importance of personalized service. We visit only one house a day so that we can spend as much time at your home as necessary. Your satisfaction is guaranteed or we will refund your money. Owning a home comes with enough headaches – you don’t need any surprises, especially major, unexpected repairs. Our thorough home inspections include 150 checkpoints in and around the home, including the foundation, roof, and all major systems, such as electrical, plumbing, and HVAC. If left undetected and untreated, termites can cause serious damage to your home, weakening the floor structure and support beams. As a licensed Inspector for Wood Destroying Insects, we can let you know quickly if you have a termite problem, the extent of the damage, and help you plan a course of action. Underground septic systems can be out-of-sight and out-of-mind – until the moment there’s a problem, and a failed septic system can cost thousands and thousands of dollars to fix or replace. John Muller Home Inspection has the experience and expertise to conduct a thorough inspection, identifying any concerns. 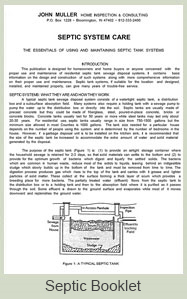 With every septic inspection, we provide a detailed Septic Booklet on septic system care. To learn more about John Muller Home Inspection, please visit our About page. To learn more about the services offered, including our 150-point home inspection checklist, please visit our Services page. © John Muller Home Inspection. All Rights Reserved.